Roger Hennefeld and Goose skin up Snowmass on Nov. 4. This season, dogs won't be allowed at Buttermilk, Snowmass and Highlands between 7:45 a.m. and 4:45 p.m.
Aspen Skiing Co. has reduced the time that dogs can spend on its ski slopes this winter because officials said there have been too many problems in recent seasons. Dogs will be prohibited between 7:45 a.m. and 4:45 p.m. at Snowmass, Buttermilk and Aspen Highlands, Skico officials announced Thursday. 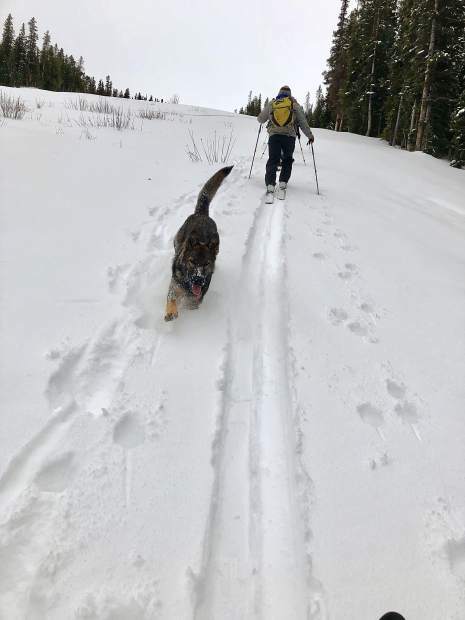 Uphillers with their pets must be down to the base by 7:45 a.m. and they cannot start up until after 4:45 p.m. Canines are always off-limits during ski season at Aspen Mountain. “We’ve had collisions with dogs. We’ve had people bitten by dogs. 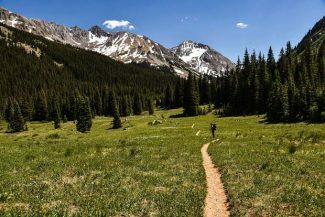 We’ve had employees chased by dogs,” Katie Ertl, Skico senior vice president of mountain operations, said Monday at a community meeting the company hosted for uphill enthusiasts. 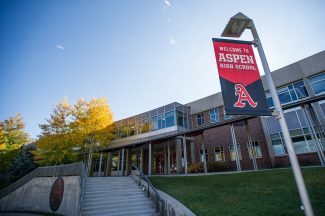 She said she appreciates that Aspen is a dog-friendly town but policy changes were needed because of the problems. She urged understanding and compliance from the public. Signs are being made with the new hours and will be posted as soon as possible. “Employees may have a conversation or respectfully turn you around if your timing is outside the hours posted,” Ertl said Thursday. The mountain managers endorsed the call for stricter dog rules at Monday’s meeting, citing too many conflicts between canines and people or machinery on the slopes. 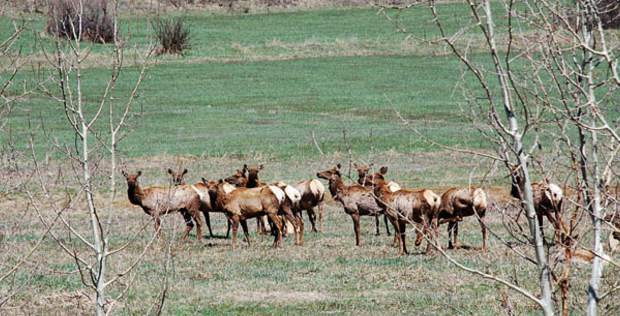 Last season, dogs were prohibited during “hours of operation,” but there wasn’t a clear definition of those times. Many “uphillers” — hikers and people who put skins on their skis or split boards to ascend — interpreted it to mean they had to be off the slopes only while the chairlifts were operating. Snowmass used to allow dogs on leashes throughout the day, but that policy was altered two seasons ago. At the community meeting, Skico officials said their hours of operation start well before and after the lifts spin. Patrollers and mountain operations folks are typically whizzing around the slopes on boards or snowmobiles to prepare the ski area for the day. Snowcats are often finishing grooming runs. Skico officials delayed setting a time when dogs can be on the slopes at the community meeting, but they conferred this week to establish the hours. The prohibition likely will extend later in the day once the chairlift operating hours change as days get longer later in the winter. Even with the adjustment on the times dogs can be on slopes, the biggest canine issue will persist unless dog owners mend their ways. Skico officials said their biggest headache is dealing with waste because some owners don’t pick up after their dogs. Skico officials painted a dreadful sight by explaining how snowcats smear the droppings on the white slopes when they run over them. The prospects are even grimmer if piles remain on the slopes when paying customers ski down, Beezer said. Officials also lamented that some people leave the ubiquitous plastic bags on the slopes after picking up after their pets. “There is no poop fairy, but sometimes I am the poop fairy along with my sister, Megan (Bourke),” Ertl said. The biggest problem is on the lower slopes. Dogs tend to go quickly after getting released from a vehicle. For that reason, dogs must be leashed at all times at the base of Tiehack, a popular uphill launch destination during the season, Ertl said. One member of the audience at the community meeting urged fellow uphillers to scan the lower slopes on their way down and pick up any dropping left behind. Skico officials also urged the uphill community to comply with closures, follow designated routes and, most importantly, avoid snowmaking power and water lines as well as cables for winch cat operations.